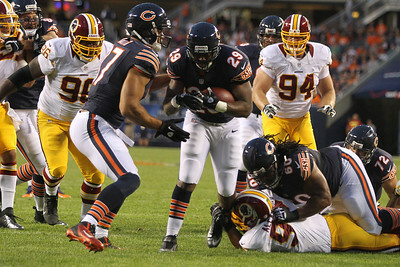 The Chicago Bears defeated the Washington Redskins 33-31 in a preseason game Saturday, August 18, 2012 at Soldier Field in Chicago. 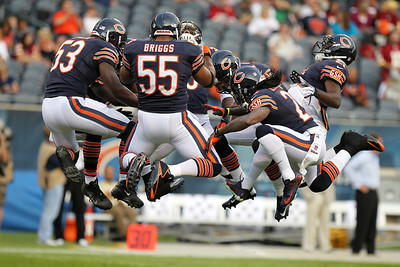 Mike Greene - mgreene@shawmedia.com Bear linebacker Lance Briggs jumps in the air with teammates before the start of a preseason game against the Washington Redskins Saturday, August 18, 2012 at Soldier Field in Chicago. 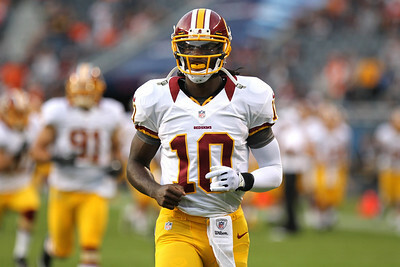 Mike Greene - mgreene@shawmedia.com Redskins QB Robert Griffin III leads his team onto the field before a preseason game against the Bears Saturday, August 18, 2012 at Soldier Field in Chicago. Mike Greene - mgreene@shawmedia.com Bears quarterback Jay Cutler holds onto a defender while scrambling during a preseason game against the Washington Redskins Saturday, August 18, 2012 at Soldier Field in Chicago. Mike Greene - mgreene@shawmedia.com Bears wide receiver Alshon Jeffery gets is wrapped up by a defender after a reception during a preseason game against the Washington Redskins Saturday, August 18, 2012 at Soldier Field in Chicago. Mike Greene - mgreene@shawmedia.com Bears running back Michael Bush crosses the endzone for a touchdown in the first half of a preseason game against the Washington Redskins Saturday, August 18, 2012 at Soldier Field in Chicago. 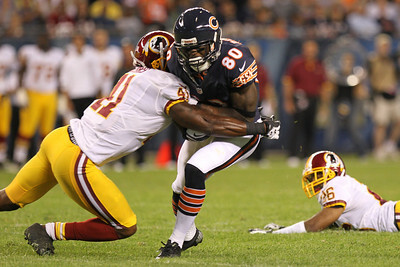 Mike Greene - mgreene@shawmedia.com Bears wide receiver Earl Bennett is hit by Redskins safety Madieu Williams during a preseason game Saturday, August 18, 2012 at Soldier Field in Chicago. 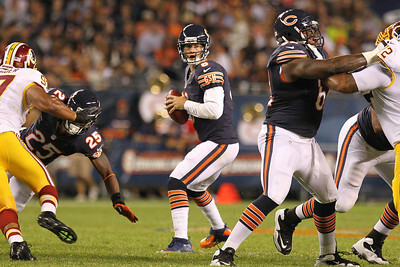 Mike Greene - mgreene@shawmedia.com Bears quarterback Jay Cutler looks downfield for an open receiver during a preseason game against the Washington Redskins Saturday, August 18, 2012 at Soldier Field in Chicago. 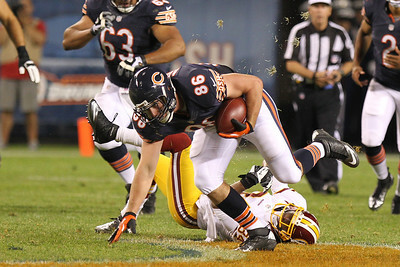 Mike Greene - mgreene@shawmedia.com The Bears' Brandon Hardin dives after Redskins returner Brandon Banks during a preseason game Saturday, August 18, 2012 at Soldier Field in Chicago. Banks took the kick all the way to the endzone for a touchdown. Mike Greene - mgreene@shawmedia.com Bears tight end Kyle Adams catches his balance after a catch during a preseason game against the Washington Redskins Saturday, August 18, 2012 at Soldier Field in Chicago. 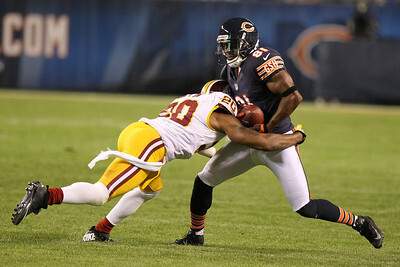 Mike Greene - mgreene@shawmedia.com Bears wide receiver Rashied Davis is hit by Redskins cornerback Cedric Griffin during a preseason game Saturday, August 18, 2012 at Soldier Field in Chicago. Mike Greene - mgreene@shawmedia.com Bears wide receiver Chris Summers goes up for a catch during a preseason game against the Washington Redskins Saturday, August 18, 2012 at Soldier Field in Chicago. 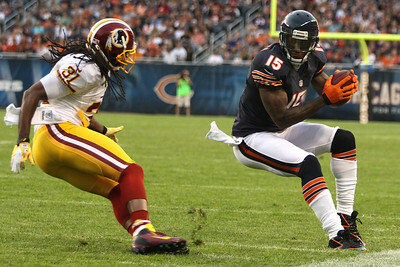 Mike Greene - mgreene@shawmedia.com Bear wide receiver Brandon Marshall puts the breaks on before going out of bounds after a reception during a preseason game against the Washington Redskins Saturday, August 18, 2012 at Soldier Field in Chicago. 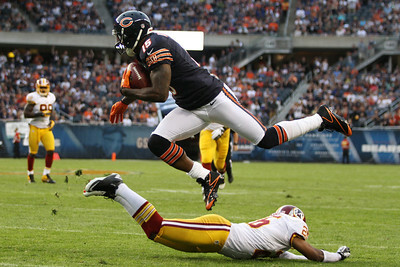 Mike Greene - mgreene@shawmedia.com Bear wide receiver Brandon Marshall hurdles a defender during a preseason game against the Washington Redskins Saturday, August 18, 2012 at Soldier Field in Chicago. 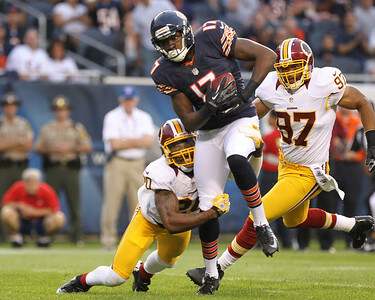 Bears wide receiver Alshon Jeffery gets is wrapped up by a defender after a reception during a preseason game against the Washington Redskins Saturday, August 18, 2012 at Soldier Field in Chicago.